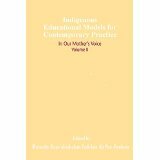 Indigenous Educational Models for Contemporary Practice: In Our Mother’s Voice by Maenette Kape’ahiokalani Padeken Ah Nee- Benham, Vol. II, (2008) challenges teachers, researchers, educational leaders, and community stakeholders to build dynamic learning environments through which indigenous learners can be “Boldly Indigenous in a Global World!” Three days of focused dialogue at the 2005 World Indigenous Peoples Conference on Education (WIPCE) led to the charge to create Volume II of Indigenous Educational Models for Contemporary Practice: In Our Mother’s Voice. Building on the first volume, Volume II examines these topics: Regenerating and transforming language and culture pedagogy that reminds us that what is “Contemporary is Native”; Living indigenous leadership that engages and ensures the presence, readiness, and civic work of our next generation of leaders; Indigenizing assessment and accountability that makes certain that native values and strengths lead this important work; Highlighting the power of partnerships that begin with the child-elder, which is then nurtured in community and institutions to cross boundaries of cultural difference, physical geography, native and non-native institutions and communities. Indigenous Educational Models for Contemporary Practice: In Our Mother’s Voice, Volume II honors the wisdom of our ancestors, highlights the diversity of our indigenous stories, and illuminates the passion of forward-looking. Culture and Educational Policy in Hawai‘i by Maenette K.P. 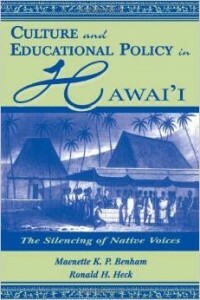 A Benham and Ronald H. Heck (1998) is a comprehensive educational history of public schools in Hawai’i that shows and analyzes how dominant cultural and educational policy have affected the education experiences of Native Hawaiians. Drawing on institutional theory as a scholarly lens, the authors focus on four historical cases representing over 150 years of contact with the West. They carefully link historical events, significant people, educational policy, and law to cultural and social consequences for Native Hawaiian children and youth. The authors argue that since the early 1800s, educational policy in Hawai’i emphasizing efficiency has resulted in institutional structures that have degenerated Hawaiian culture, self-image, and sovereignty. Native Hawaiians have often been denied equal access to quality schools and resulting increased economic and social status. These policies were often overtly, or covertly, racist and reflected wider cultural views prevalent across the United States regarding the assimilation of groups into the American mainstream culture. The case of education in Hawai’i is used to initiate a broader discussion of similar historical trends in assimilating children of different backgrounds into the American system of education. The scholarly analysis presented in this book draws out historical, political, cultural, and organizational implications that can be employed to understand other Native and non-Native contexts. Given the increasing cultural diversity of the United States and the perceived failure of the American educational system in light of these changes, this book provides an exceptionally appropriate starting point to begin a discussion about past, present, and future schooling for our nation’s children. Because it is written and comes from a Native perspective, the value of the “insider” view is illuminated. This underlying reminder of the Native eye is woven throughout the book in Ha’awina No’ono’o–the sharing of thoughts from the Native Hawaiian author. 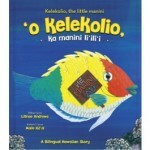 ‘O Kelekolio Ka Manini Li’ili’i (ʻōh) by Lilinoa Andrews (2011) is the story of a little fish that learns the hard way when he disobeys his mother’s warning and goes near a forbidden underwater pipe. In the process, he loses all his scales. It’s now up to Kelekolio, the little manini, to find help in replacing his scales and to cover up his mistake. Publications by the faculty of the Kamakakūokalani Center For Hawaiian Studies can be found here. Publications by the faculty of Kawaihuelani Center For Hawaiian Language can be found here.